I stopped in J.Crew last night to make a few returns and tried on a few items from the last rollout. I was mostly looking to kill time while waiting to meet up with a friend and hadn’t been in store since the last round of spring clothing was released. 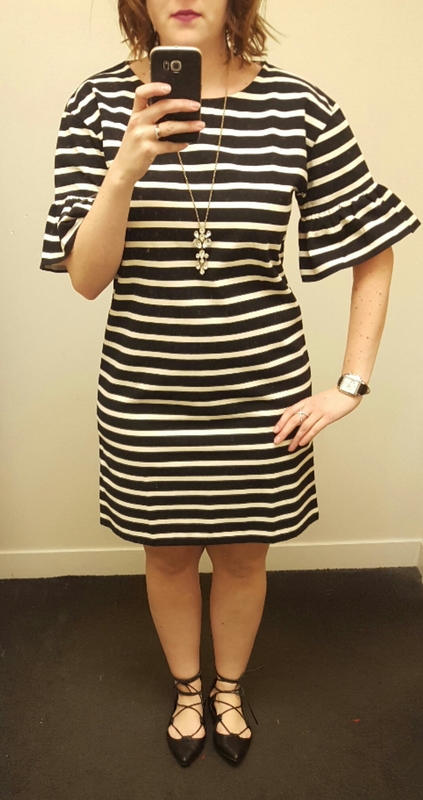 First up, I tried the Ruffled Bell-Sleeve Shift Dress in Stripe. I’ve seen the top on a few people and thought it looked cute and really I was curious to see if this would be surprisingly cute or a too-short disaster. I went with a size large. Shockingly, it was not too short. It was, however, very large in the arms and chest area. I couldn’t have sized down to a medium or I would have been squeezed in there. The sleeves are a bit too much for me. My SA took one look at me and shook her head. I did like the material, was on the stiffer side with a little bit of stretch but not too much. The website bills the length on this to be 35 1/2″ and I think I’d have to question that as this hit just above my knee. I think this will look cute on others if it fits better through the whole body but it wasn’t for me. Next up, the Contrast Eyelet Dress. I didn’t remember seeing this online or in the catalog but figured I’d try it. I am not loving the pleated skirt, I would have preferred a regular A-line skirt. The material is a white and black eyelet material – I should have grabbed a close up. This wasn’t a love for me. I could have lived without the slit in the neck as well. I liked last year’s punched eyelet dress much better. This is a size 12. Next up, the Tipped Sheath in Dotted Jacquard. This is a size 12 and juuust fit. Maybe some Spanx required to smooth me out in the midsection. 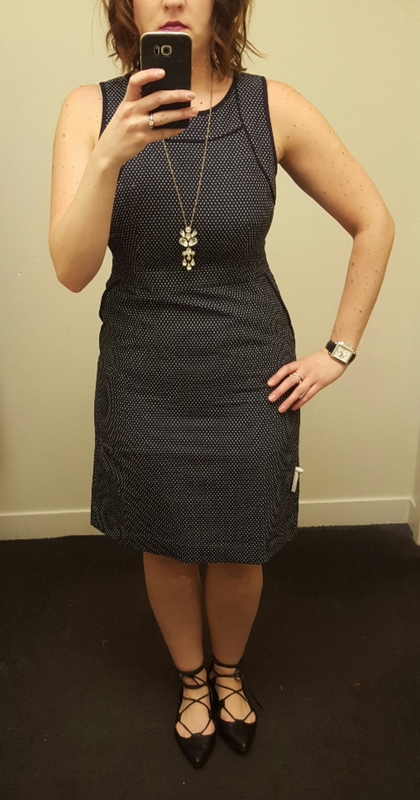 This is a good dress for work, but I didn’t love it so I would wait for sale on this one. The material doesn’t have any stretch and is a cotton poly blend. I also had a little bit of pancake chest going on but I did appreciate that it falls to the knee so kudos to longer dresses! 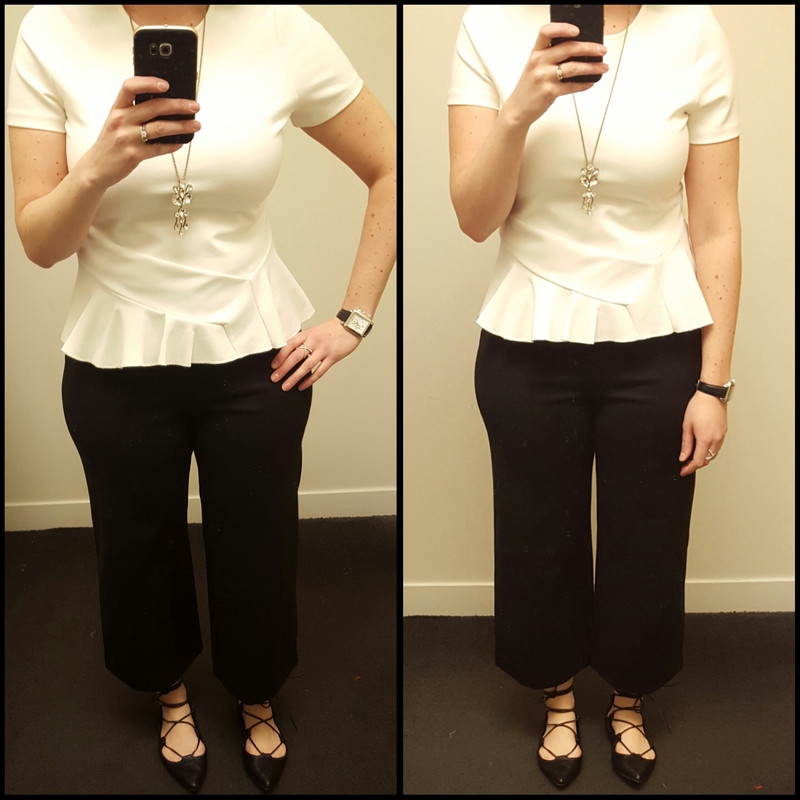 Next up was my surprise love – the Wide Leg Ponte Pants. The largest my store had was a size 10 which is a size down from my regular pant size so that’s what I went with. I’m also a size 10 in the Pixie pants, and these are the same material as the (original softer) Pixie pants. They are incredibly comfortable, side zip and while I felt like I had a little bit of pulling in my midsection, they would be too large in a size up. I could see these working for weekend and work – they were really fun with the lace up flats but I’d wear them with a blouse or Tippi and heels to work as well. The black was a little tough to capture in the dressing room but they hit me above the ankle and I am 5’8″. I didn’t buy them last night but I can’t stop thinking about them! Last up, the Embroidered top in white. This was cuter than I expected as well, a little on the sheer side but I’ll wait for this one to hit sale as well. I’m wearing a large which was a good choice. 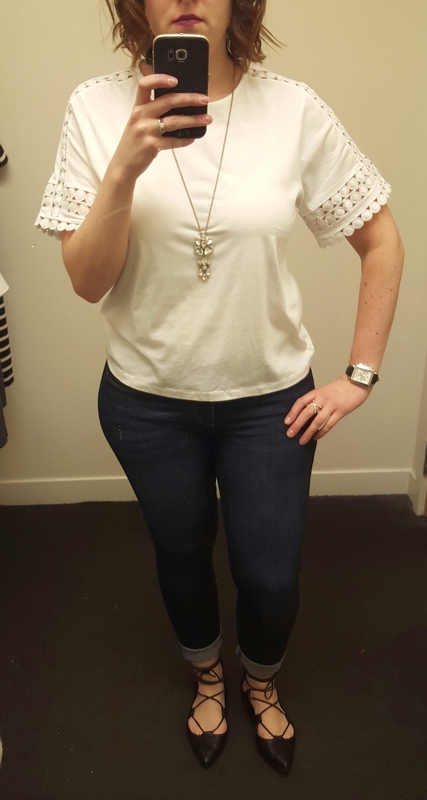 I’m usually not in to pom poms and a lot of “stuff” on my shirts but I liked it for a white summer tee. So, what do you think? Have you tried any of these? Any loves? Not so much? Would love to hear what you think and thanks for visiting!